1/8inch Sorbothane, black per squar..
1/8 inch Sorbothane, red per square..
3/16 inch Sorbothane, black per squ..
3/16 inch Sorbothane, red per squar..
1/4 inch Sorbothane, black per squa..
1/4 inch Sorbothane, red per square..
1/10 inch Sorbothane, clear 6in x 12..
1/8 inch Sorbothane, clear 6in x 12i..
1/8 Sorbothane, clear per square foo..
3/16 inch Sorbothane, clear per squa..
1/4 inch Sorbothane, clear per squar..
Sorbothane is an impact absorbing polymer. 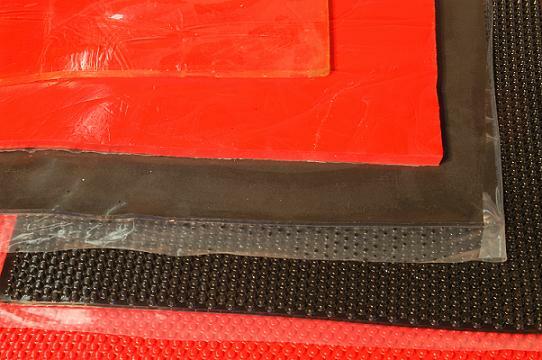 We stock Sorbothane sheet in Black, Red, and Clear, various thicknesses, and bumpy or smooth. Frequently used behind bullet hit shields to minimize the impact. Our Sorbothane is made in lots for us to our specifications. In this picture, the top sheet is clear, followed by red, black, black bumpy and red bumpy, separated by clear polyethelene.